At some point in time, every homeowner considers conducting a kitchen remodeling project. With all the options that are available to you, this task can seem daunting. At Vogel Home Improvement, your Anchorage kitchen remodeling contractor, Bob Vogel, is here to help you get your project off the ground. The key to a successful and highly rewarding kitchen remodeling project is planning. Because the living space is both important from an aesthetic and a functional perspective, it is important to understand what changes you are planning to make and how these changes will affect the overall use and enjoyment of the area. As a skilled kitchen design professional, Bob can work with you to ensure that you are making the most rewarding changes possible. Call Vogel Home Improvement today if you would appreciate help planning your next kitchen remodeling project. Bob would be happy to take your call and discuss your needs and goals with you. In the meantime, your remodeling contractor has developed this guide in order to help you effectively plan your project. The first thing that you should do when planning for kitchen remodeling in Anchorage is to analyze the existing layout of your kitchen. During this time, you should assess the features that you want to keep in the living space and determine what you would like to change. Taking measurements of the area is a good way to determine what can be accomplished before you start renovating. 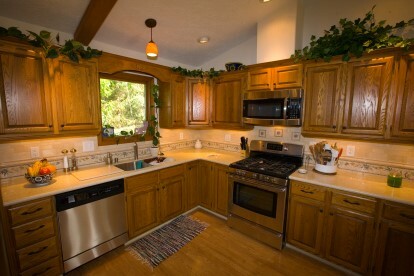 An Anchorage kitchen design expert can provide you with helpful advice during this effort. After you have determined the basic layout of your kitchen, you should then set a list of goals that you want to accomplish. A good way to do this is to make a list based on priority. On this list, you should include everything from basic aesthetic design concepts to major and expensive overhauls. When you have this set of goals in mind, your Anchorage kitchen remodeling contractor can help you know exactly what you can accomplish. With his guidance, you will be able to include both major and minor changes while also being able to avoid attempting to do too much. In this way, both the process and the end results are highly rewarding. Far too often, people fail to take full advantage of their kitchen remodeling efforts. No matter how beautiful your kitchen ends up being, if it is not customized to the ways in which you use the living space, you missed an opportunity during the remodeling effort. An Anchorage kitchen remodeling contractor can help ensure that you are making changes that will be customized to how you and your family use the area. In this way, you can ensure that you and your family will be completely pleased with your remodeling project for years to come.